Enhanced video footage of George Zimmerman about 30 minutes after he shot Florida teenager Trayvon Martin shows little evidence of a broken nose, the president of the Florida College of Emergency Physicians said today. 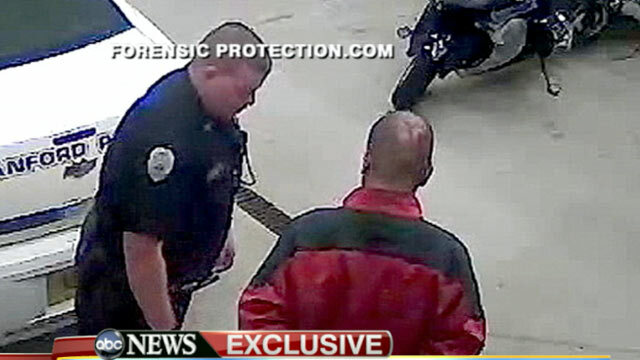 But the video does show what could be an injury to the back of Zimmerman's head. Zimmerman, 28, claims Martin, 17, punched him in the nose, knocked him down and repeatedly slammed his head into the ground. The police surveillance video, first obtained exclusively by ABC News last month and clarified by Forensic Protection, Inc., shows Zimmerman exiting the police cruiser with his hands cuffed behind his back. Zimmerman is frisked and then led down a series of hallways, still cuffed. At one point, one of the officers stops to look briefly at the back of Zimmerman's head. There was no obvious sign of any injury to Zimmerman's head or face on the video until it was enhanced. But Dr. Vidor Friedman, president of the Florida College of Emergency Physicians, remains unconvinced. "If somebody had been beating his head against concrete I'd think we'd see more obvious scrapes," Friedman said. He also said he would expect to see bandages on Zimmerman's head. More significantly for Friedman was the condition of Zimmerman's nose. "All of the ridges in his nose are clearly defined. You would expect significant swelling in the hour or two after a break. There appears to be none. It doesn't look like his nose was broken or badly broken," Friedman said. The initial police report noted that Zimmerman was bleeding from the back of the head and nose, and his lawyer later claimed that Zimmeran suffered a broken nose. After receiving medical attention at the scene of the shooting, it was decided that he was in good enough condition to travel in a police cruiser to the Sanford, Fla., police station for questioning. He did not check into the emergency room following the police questioning. The surveillance tape of Zimmerman, later released by the Sanford Police Department, could be used as evidence if Zimmerman is brought up on charges, sources tell ABC News. Zimmerman's lawyer, Craig Sonner, has said his client felt "one of them was going to die that night," when he pulled the trigger. The case has gained national prominence with rallies across the country demanding that Zimmerman be arrested and charged with murder. Lawyers for Martin's family sent a letter to the Justice Department today asking that the federal probe into the killing look into the fact that Sanford Police Chief Bill Lee met with State Attorney Norm Wolfinger on the night of shooting. Lawyer Benjamin Crump also claims in the letter that members of Zimmerman's family were also present in the police station that night. The lead homicide investigator, Chris Serino, wrote in an affidavit that he recommended manslaughter charges be brougth against Zimmerman but was advised by the prosecutor not to file charges because there was not enough evidence for a conviction, sources have told ABC News. "We look forward to your thorough and comprehensive review of the suspicious circumstances surrounding this meeting," Crump wrote. A Justice Department spokesman said the agency will review the Martin family letter. State prosecutors are expected to go before a Seminole County grand jury on April 10 to determine what, if any, files should be charged. An analysis of a 911 call done over the weekend by the Orlando Sentinel determined that screams for help overhead on a 911 came from Martin, although Zimmerman's family insist they recognize his voice in the screams. Two evidence experts consulted by the Sentinel found the voice heard in a 911 call placed by a woman in a home near where the shooting occurred was only a 48 percent match to Zimmerman's voice. One of the experts, Tom Owen, told the Sentinel to reach a positive match he would expect higher than 90 percent. "As a result of that, you can say with reasonable scientific certainty that it's not Zimmerman," Owen told the paper. Owen,the chair emeritus at the American Board of Record Evidence, was not able to determine if the voice was that of Martin, the Sentinel reports, because he did not have audio of the teen's voice to compare to the shouts for help in the 911 call.